Games have never been as mainstream and comprehensive as they are today. The video games of today are bigger, tell complex narratives, and built on technologically elaborate gaming engines. Games are also no longer the province of certain countries, like the US or Japan—they’re much more diverse and multicultural. The protagonists, narratives and settings embrace the global appeal of video games. Contemporary games draw on the diversity of different cultures and send their protagonists off on globe-spanning romps. And so, Lara Croft in 2018’s Shadow of the Tomb Raider lands on the island city of Cozumel in Mexico, with sequences taking place during Dia de los Muertos celebrations. This column takes a look at some contemporary games that are set in Nepal and how they’ve tried to portray this country and its cultures. The Uncharted series introduced the prolific Nathan Drake, an adventurer who closely resembles his more popular female counterpart, Lara Croft. While Lara too has been to Nepal in the past, Nathan only made it to the Himalayan nation in the second iteration of the Uncharted series of action-adventure games. While on his way to find ‘Shambala’, Nathan stops by Nepal and its tight alleyways for one chapter. Uncharted 2 depicts claustrophobic Kathmandu, with narrow alleyways and teetering buildings. While there are homages to Newar patis and the tall cement buildings of modern New Road, Kathmandu looks more like a strange amalgamation of European architectural elements with Nepali sensibilities. Fire escapes and awnings jut out of straight, bland buildings that contrast starkly with the architecture of Kathmandu’s gallis. With a few cosmetic changes, the Nepal level in Uncharted 2 could easily be set in any Indian or Middle Eastern city and nothing would’ve been missed. Some small details throughout the city do stand out, like lakhey masks on walls and small patis and shrines with characteristically Newar Valley designs. While Uncharted 2 attempts to avoid clichés, for a city that is also known as the ‘city of temples’, there is a surprising lack of temples. But prayer flags are everywhere. Unfortunately, the ‘Nepal’ level in Uncharted 2 feels hollow. Here, Nepal, or Kathmandu, is an uninhabited war-ravaged town that is simply background for the protagonist to pursue a vapid gunfight. Uncharted 2 does not depict Kathmandu very well, since it feels two-dimensional without the people and culture to support it. In what is perhaps one of the laziest depictions of Nepal in video games, Indiana Jones and the Staff of Kings portrays the country as a giant snow-filled mountain where you can’t see anything because of the storm that the protagonist finds himself in. Indiana Jones is in search of his lost comrade and ventures into Himalayan caves filled with snow and ice. During the second half of the game, the level opens up to a large temple complex. By the time Jones makes it to the complex, however, Germans seem to have overrun the space, prompting an intense gun battle. The Nepal chapter in Indiana Jones is simple, as it doesn’t have the detail of its more recent counterparts. The few houses that are present look like temples and some even resemble large Chinese living complexes. Much of Nepal in this game is a barren wasteland. Ubisoft Montreal’s Far Cry 4 is perhaps the only game that is based completely in Nepal, or Kyrat, as the game likes to call its “fictional” Himalayan country beset by a Communist insurgency. Following in the footsteps of its widely-successful predecessor, Far Cry 4 was heavily anticipated, especially once its setting was announced. The nation of Kyrat draws heavily from Nepali topography and iconography, with vibrant, lush forests and prayer flags fluttering in the wind. A mix of both Devanagari and Tibetan scripts adorn signposts while tall, majestic peaks gleamed against the sun in the distance. Aesthetically, the game represents Nepal considerably well. Large and small prayer wheels can be found across the landscape and detailed Thangka paintings adorn the walls of many houses. Geographically, Kyrat feels like half of Nepal, with hilly and mountainous sections, mud and brick houses jutting out of the terraces. The houses look like those from hilly villages with triangular roofs, and step-farms nearby. Stacks of hay are peppered throughout the villages and houses are painted in the traditional hill tones of red mud. Characters too look Nepali, and have names like Mohan Ghale, the protagonist’s father, and radio jockey Rabi ‘Ray’ Rana. But Ajay Ghale, the protagonist, looks ‘white’ and is constantly called ‘AJ’ in a crude American accent. Once the game was out, and even before, controversy had flared when Nepali players saw that characters in the game spoke in Hindi, as opposed to Nepali. The developers responded to the controversy by claiming the land to be “fictional”, ignoring just how much everything looks, feels and sounds like Nepal. 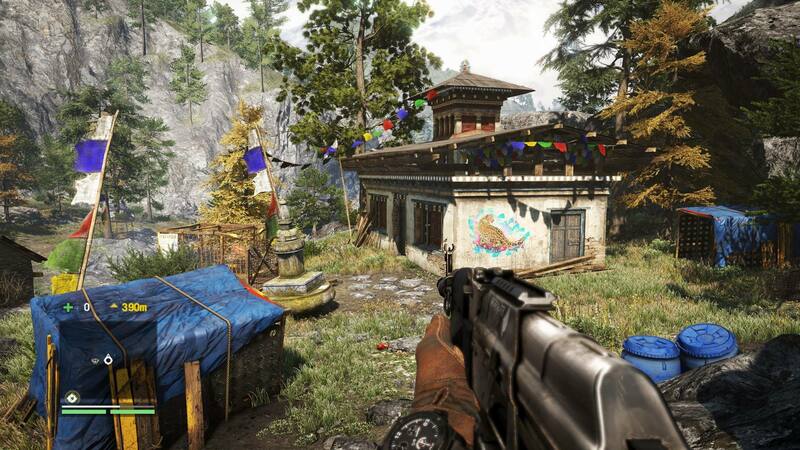 The developers say they visited Nepal during the development cycle of the game to draw inspiration, but it is unfortunate that even after a real-world visit, Nepal is still depicted through stereotypical prayer flags and prayer wheel iconography. Despite these cliches, Far Cry 4 still comes closest to depicting Nepal accurately, although its language and cultural politics vis-à-vis its large southern neighbour might have gone neglected. Overwatch, a popular team-based multiplayer game, includes a Nepal-based map. This Nepal map is separated into three broad sections: the Village, the Shrine and the Sanctum. All three areas are rendered in different styles and most of these styles have a hard time coming together as a whole. The village is populated with mud houses but within a space that feels more like the alleyways of Kathmandu, while the Shrine draws largely on the Kathmandu Valley’s temple complexes. Moving to-and-fro between these two areas feels jarring because of the difference in style, but when players reach the Sanctum, the aesthetics takes an even stranger turn as Buddhist monks stand guard in front of a large ‘monastery’ that appears to be based on Patan’s Krishna Mandir. 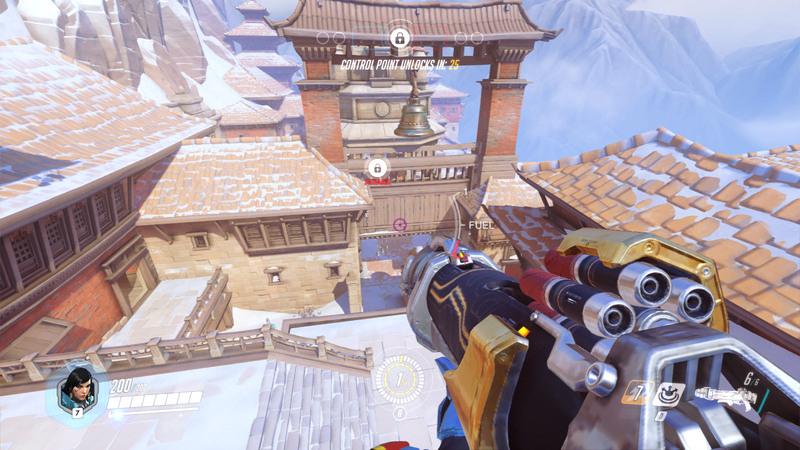 While the Nepal map on Overwatch is fun to play, it too falls short when it comes to an accurate depiction of the country. The map feels like a hodgepodge of Nepali architectural styles thrown together with Buddha statues and even some Japanese iconography and paintings thrown in. This game too includes large bronze animal statues, akin to the ones that protect temples, but the insides of these temples tend to look like cathedrals. Call of Duty, one of the most popular first-person shooters, focused primarily on multiplayer for its fourth iteration in the Black Ops sub-series, which features a multiplayer map named ‘Elevation’ based on Nepal. Elevation too plays host to the cliché of prayer flags, but it adds some well-implemented new features. The houses for once look Nepali and some even flaunt Buddhist-styled murals on their walls. Bronze statues of Manjushree praying and tall elephant statues recall the statues outside Hindu temples and in the durbar squares. But again, these elements are simply set-dressing and thus, are superficial. 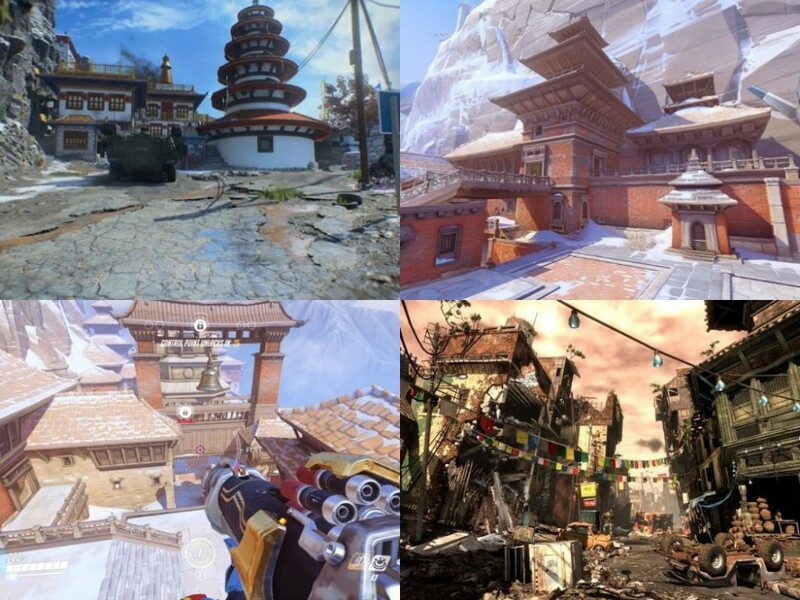 In the global gaming consciousness, Nepal seems to mean temples, pagodas and prayer flags. For Western game developers, Nepal is simply an exotic location for players, with little regard for an accurate or even studied representation of the country. Even with complex, high-budget games, Nepal’s geographical diversity, its many cultures and religions, and just as many architectural and aesthetic traditions have so far remained unrepresented.